I can't believe how quickly this is knitting up! I joined the third skein on Friday evening and was onto the fourth by Sunday afternoon. I've finished both fronts and am more than halfway through the back. Bit of a naus really, because I thought that all the plain knitting would be best for Wonderwool next weekend and now I am going to need to find something else. I fudged the neck shaping a little so that I could blend the central cable into the neckline as I went. Some of the projects on Ravelry just stop part way through a diamond, which I wanted to avoid. 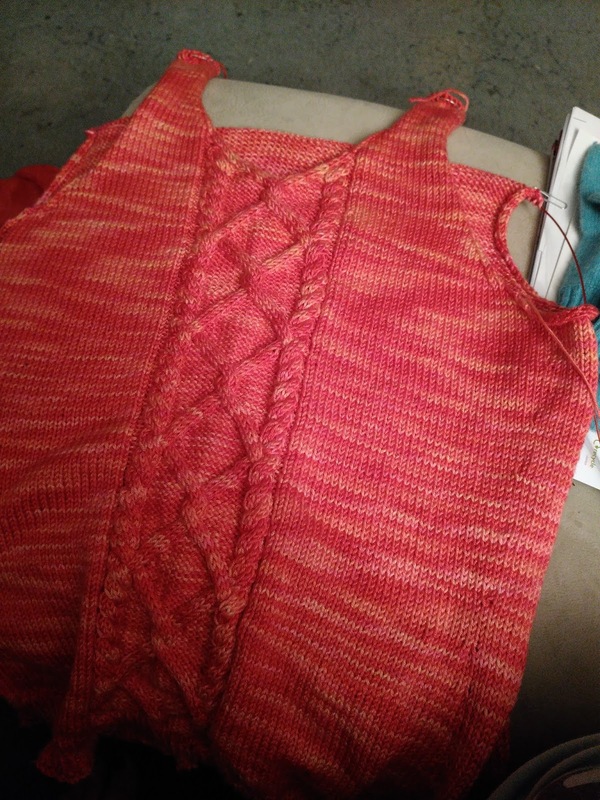 Since I am now on skein four of five, I am slightly worried about the sleeves now; but at least they are picked up and knitted down so I can do as I did with the red sweater and just carry on until the yarn runs out. This seems to be the theme of the year so far. In my defence, I had 20 yards more than the pattern requirements; I did knit it a bit longer in the body, though (of course). Quite pleased to be able to have a go at this technique for knitting sleeves, because I need to use it for a UFO I have had languishing for ages. I gave it a go in the Christmas holidays but it didn't go very well. I'm very pleased with how this is turning out - a lovely fit and the cables look so crisp in this yarn.